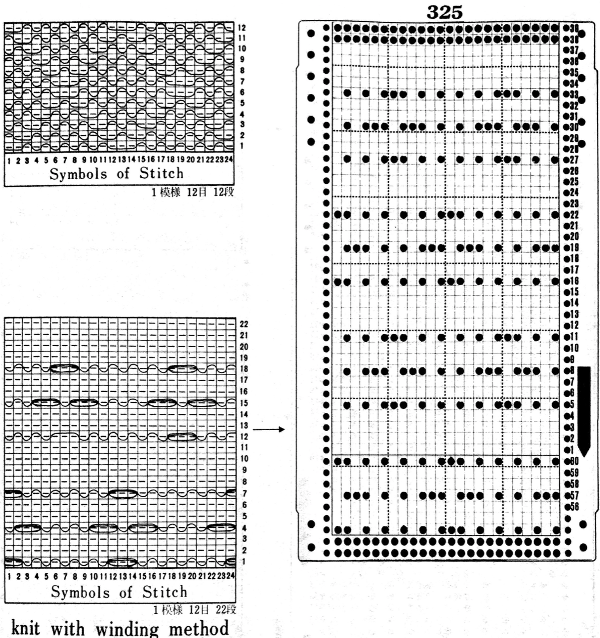 Punchcards may be used to guide one for hand techniques, here a version of e wrap is used on selected needles for weaving effect, diagram on upper left is for a different fabric. 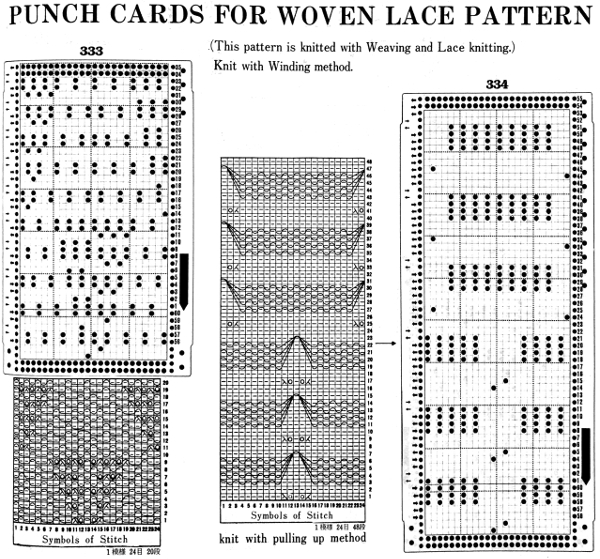 Punchcard may also be used to help track twisted stitches , cables , and racking This is a 2 carriages patterning operation, so lace extension rails must be used, with each carriage disengaged from the belt while the other is moving across the knitting and back to its resting place. 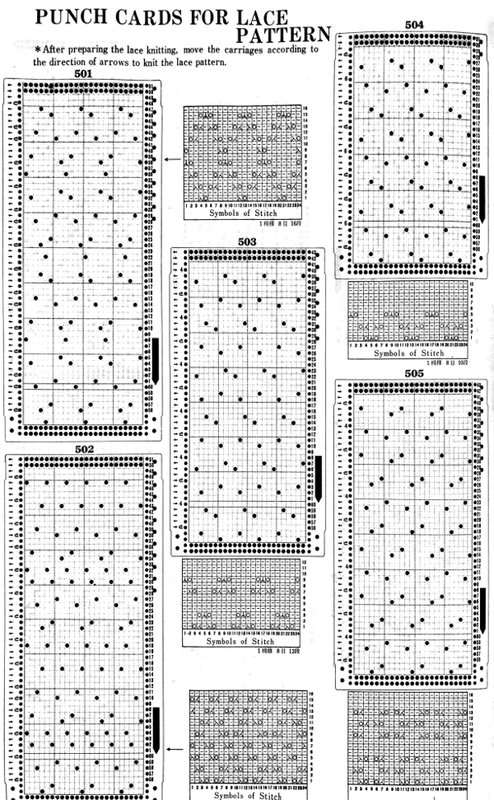 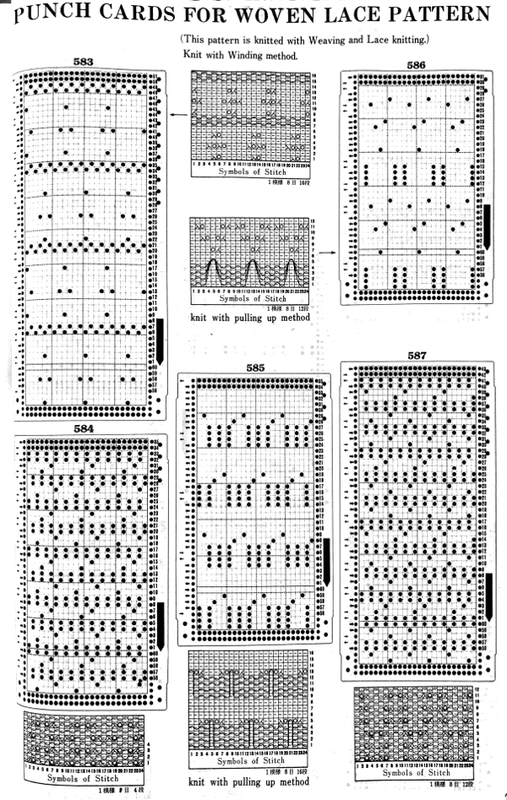 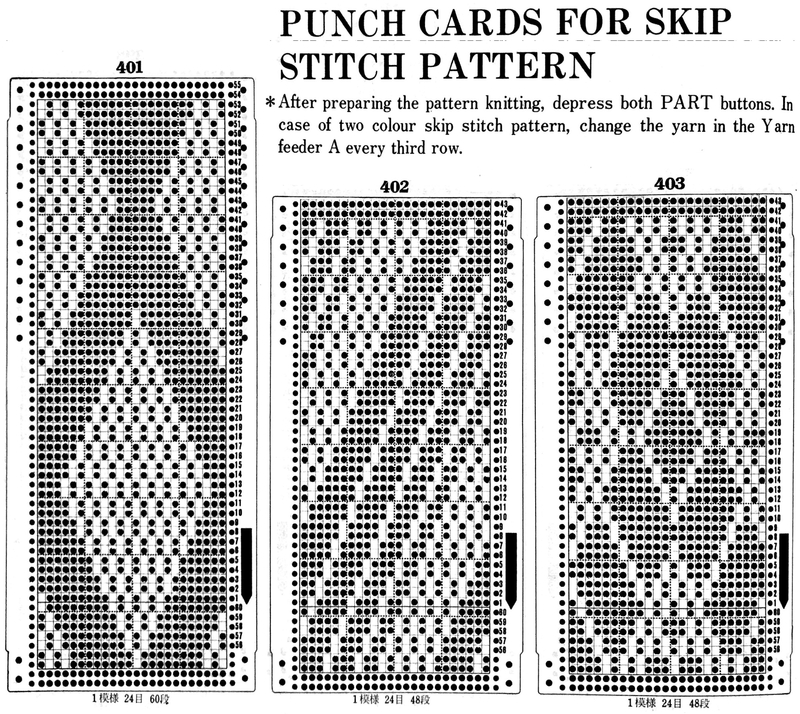 Below each punchcard, the repeat the is identified in numbers for stitches and rows. 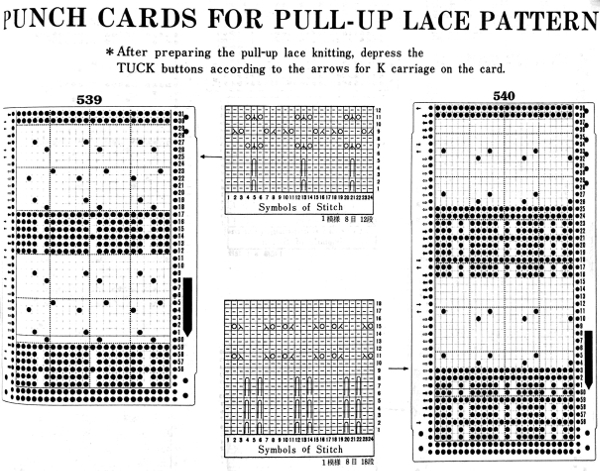 The cards presented are the minimum length required for the card to roll smoothly within the reader when joined for continuous knitting (at least 36 rows). 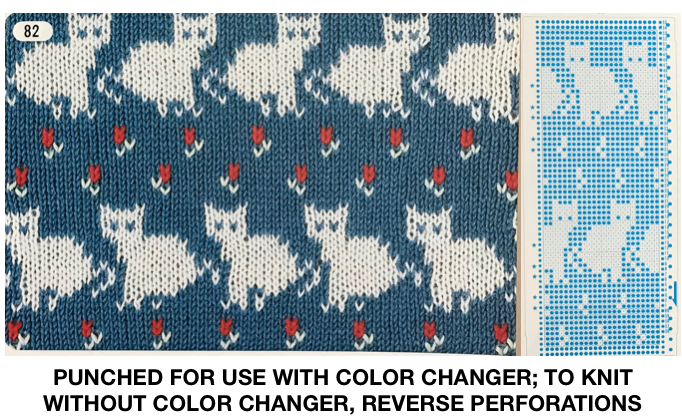 Electronic knitters may isolate the individual, smallest repeat, draw only the squares that appear as white in the cards, enter them via mylar or download, and use color reverse. 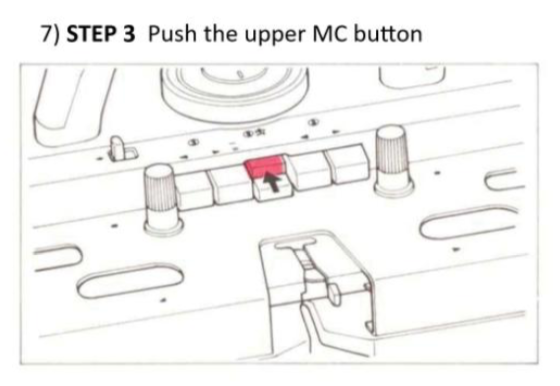 Skip is aka slip or part. 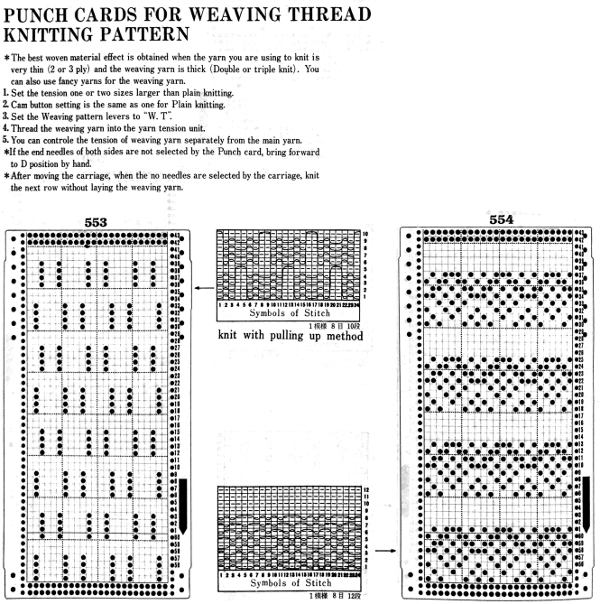 These cards would work for tuck stitch as well, may even tolerate elongation, depending on yarn thickness. 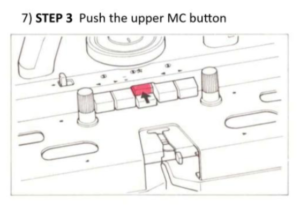 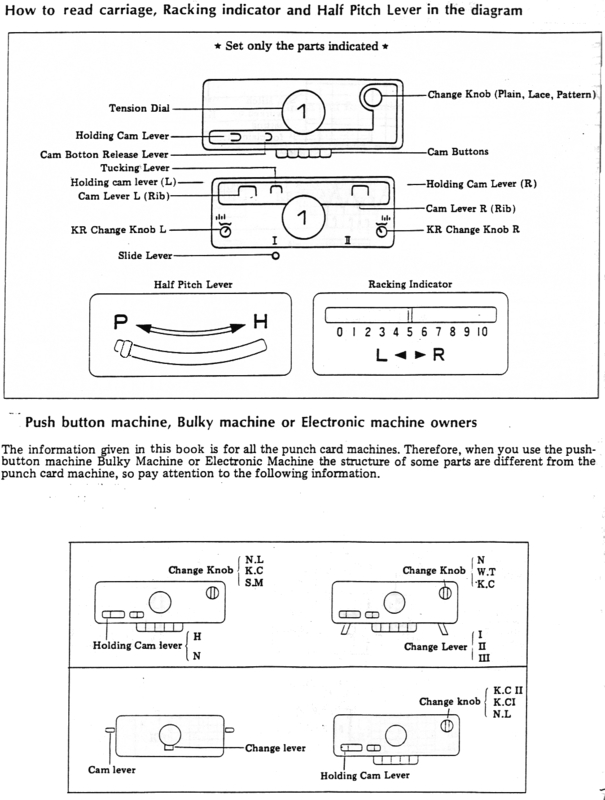 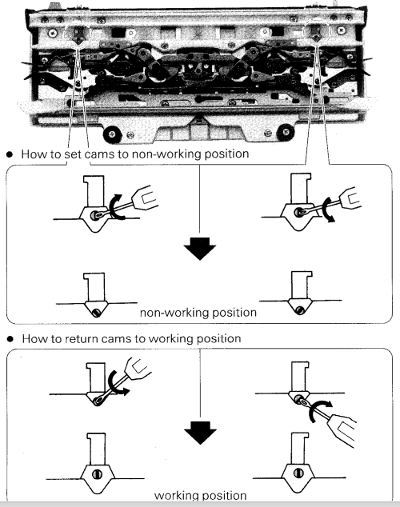 Opposite cam buttons are in use, the fabric changes appearance depending on which of the 2 stitch types is forward, so if instructions with cards are to be followed, then the starting side for pattern in this instance should be COR. 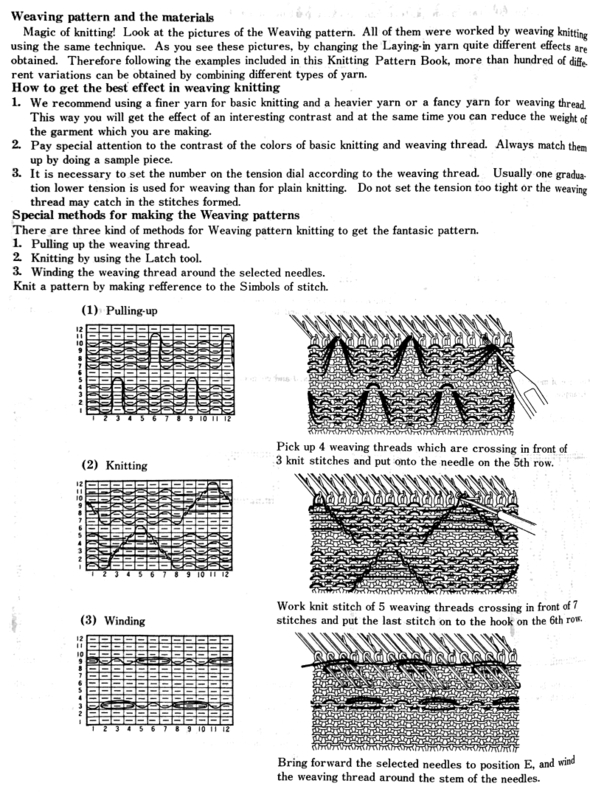 Both tuck buttons (or slip) may be used as well, for a different fabric. 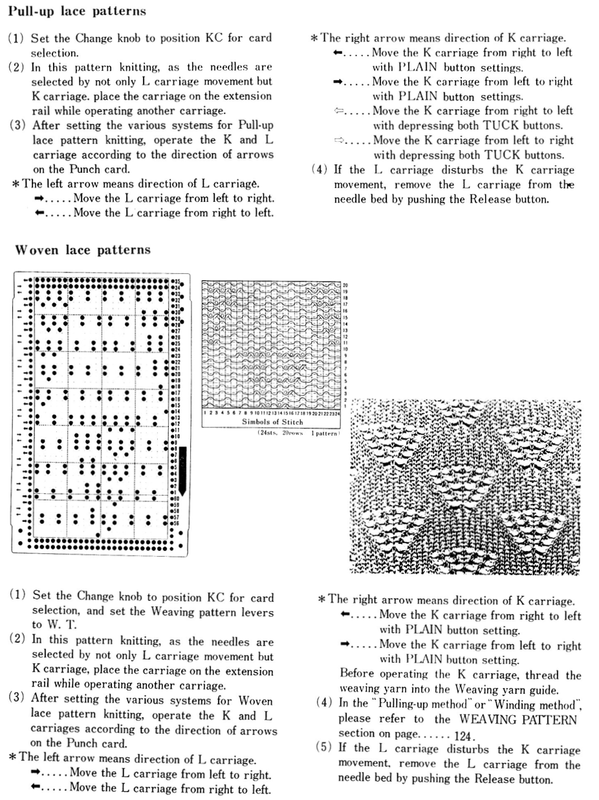 If the tuck or slip texture is created over an even number of rows (2, 4), changing colors for each paired row sequences can create some interesting color patterns with very short floats akin to planned mosaics and mazes. 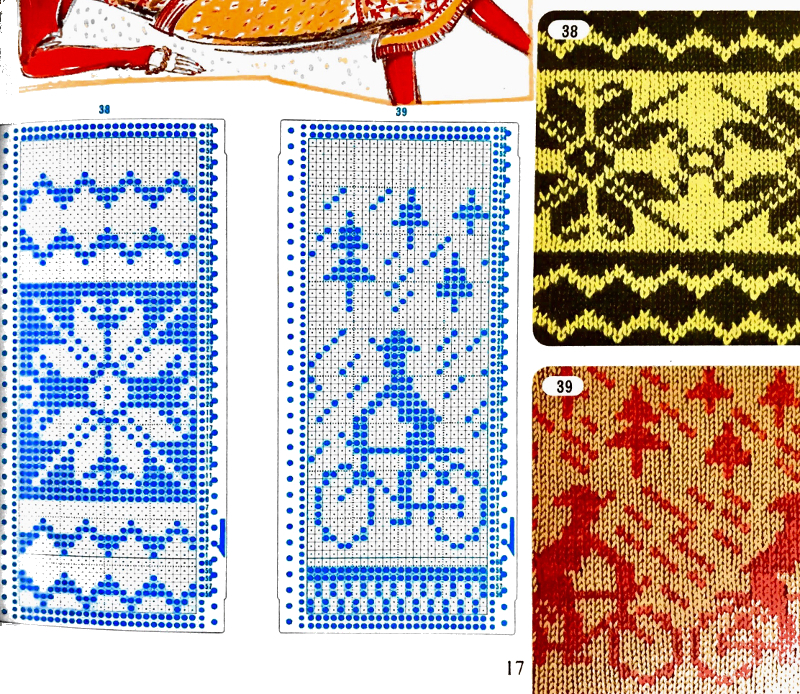 The fair isle patters below are actually poor choices in terms of float control, pushing its limits. 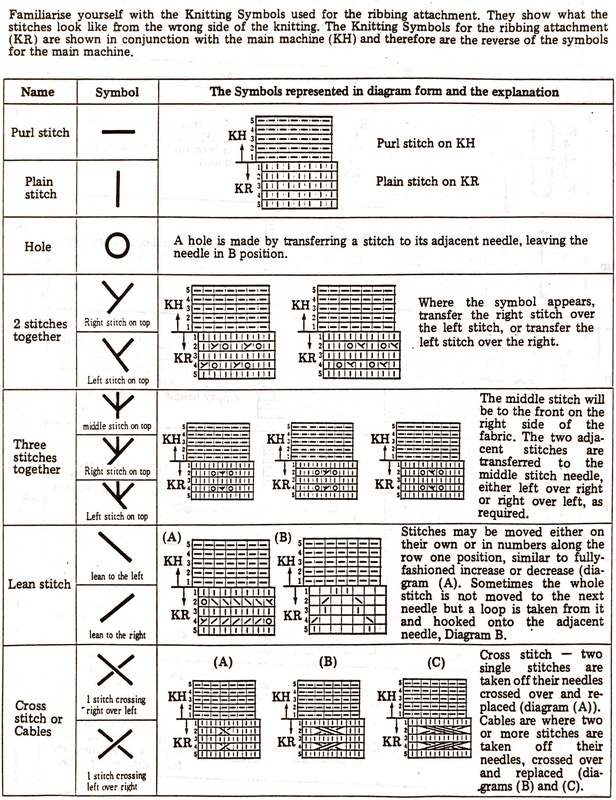 It is usually recommended that floats be no wider than 5 stitches, and even then, they may have to be controlled to make the finished garment easier to wear. 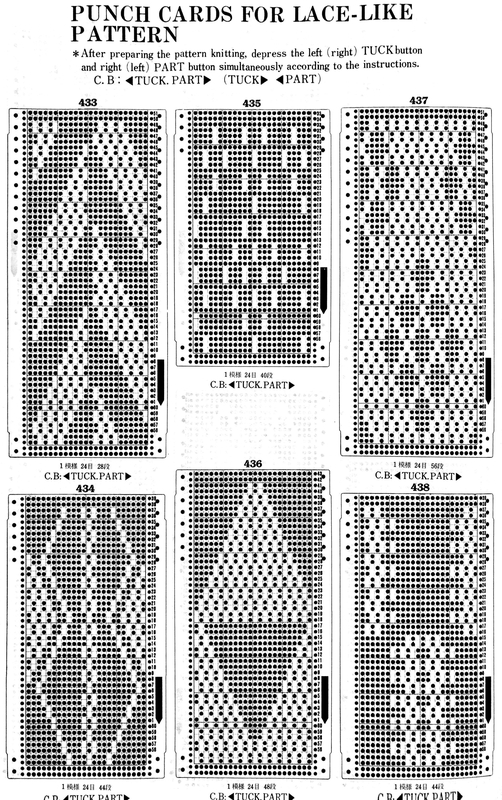 Lace card markings, including for fine lace. 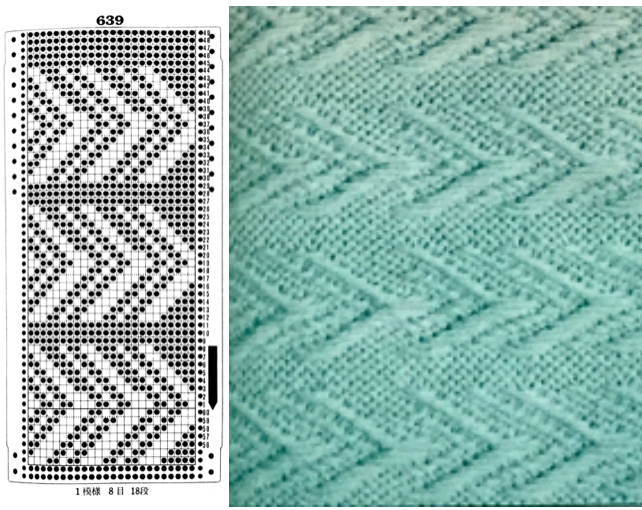 In the latter, stitches are transferred and shared between pairs of needles, best knit in a light color, with smooth yarn so surface texture becomes more noticeable. 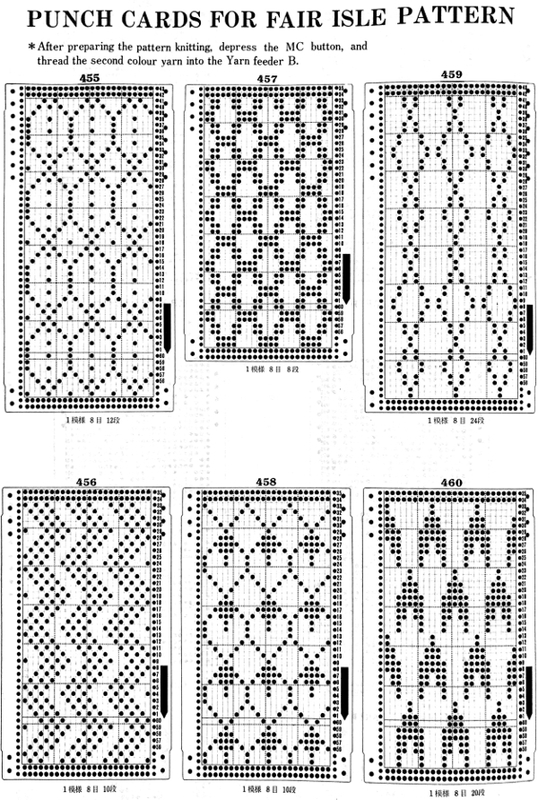 Lace point cams may be used on the punchcard machine to create vertical bands of lace. 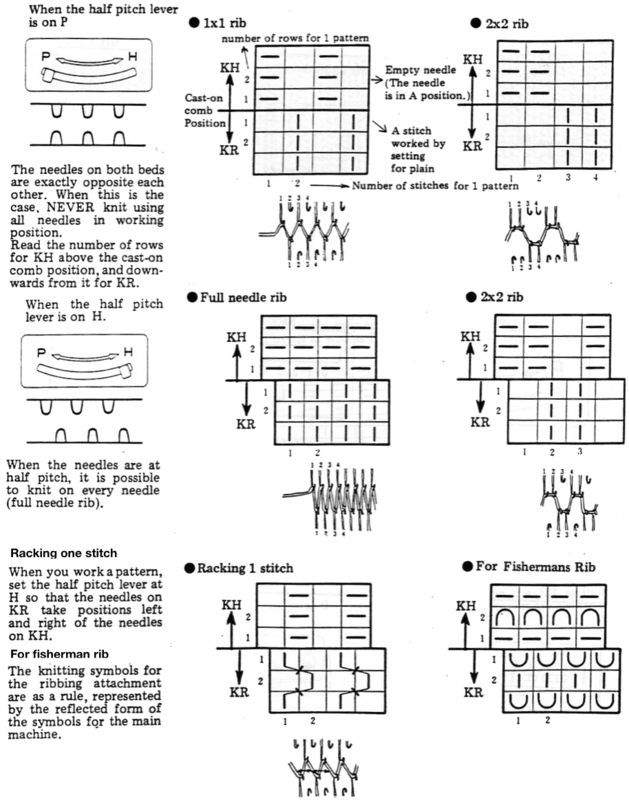 This is also achievable on the electronic by programming for knit stitches between vertical (or horizontal bands). 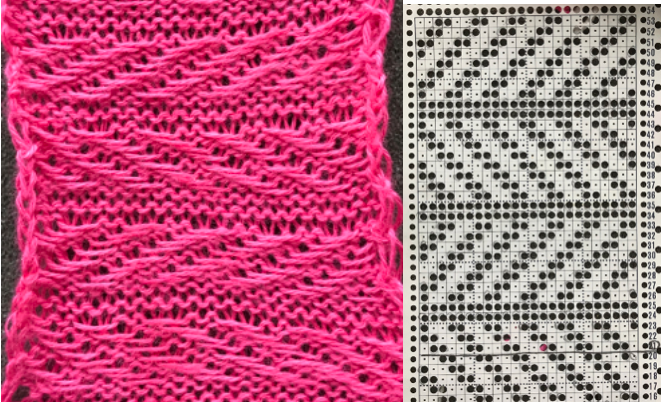 Tuck (left) and weaving (right) may be combined with lace. 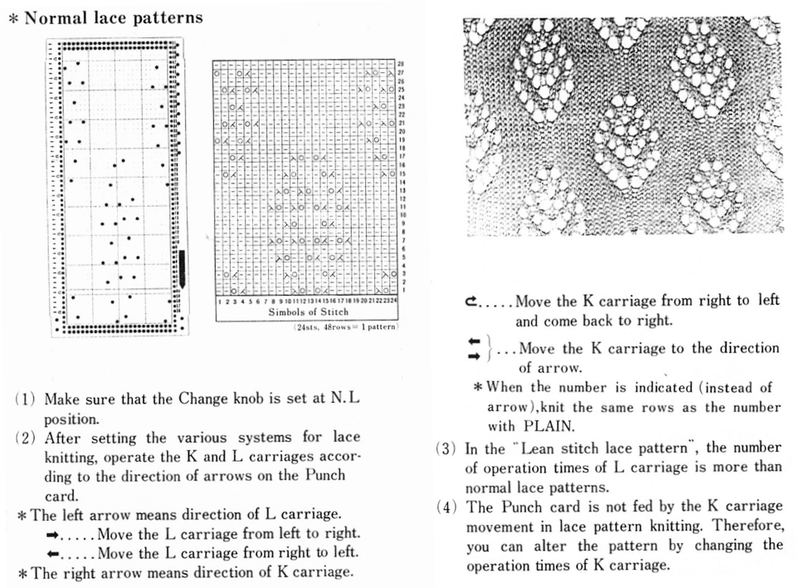 In these fabrics both carriages are selecting needles, so extension rails must be used. 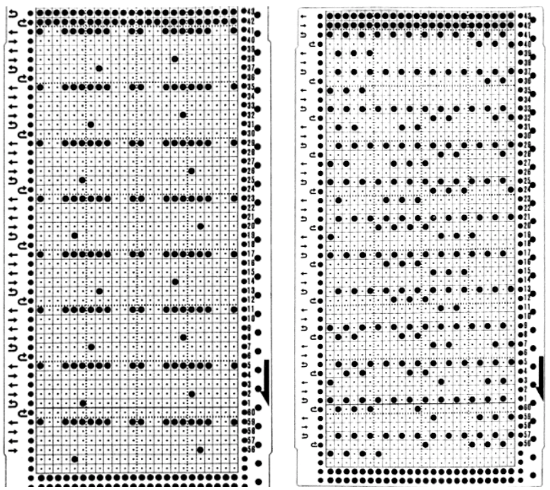 The two column on the left of the cards indicate movements for the lace carriage on left, and the knit carriage on right. 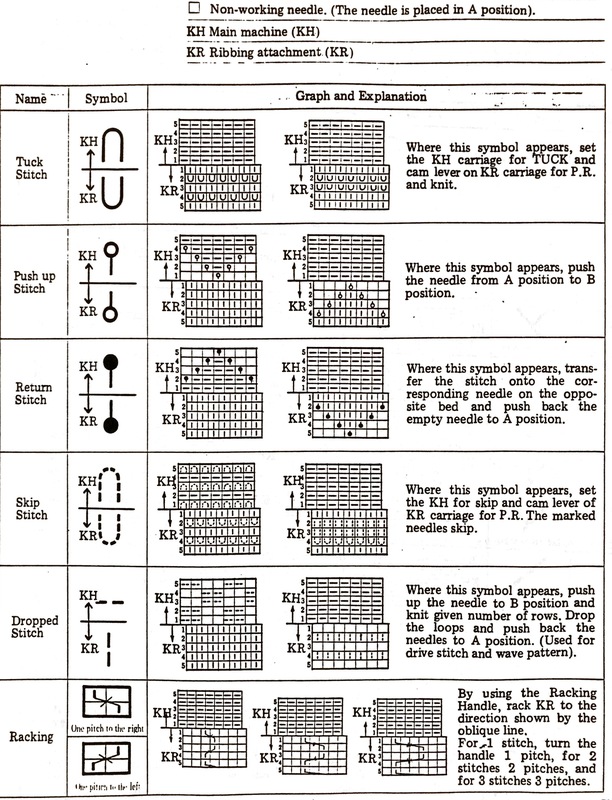 Straight arrows indicate single carriage passes, curved ones 2. 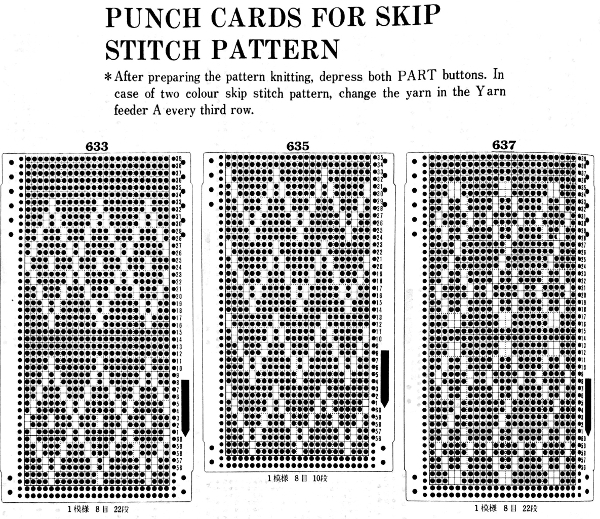 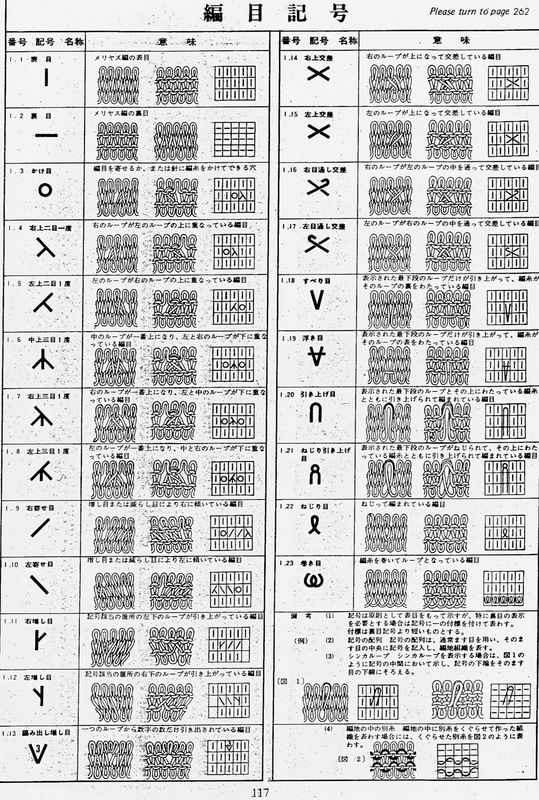 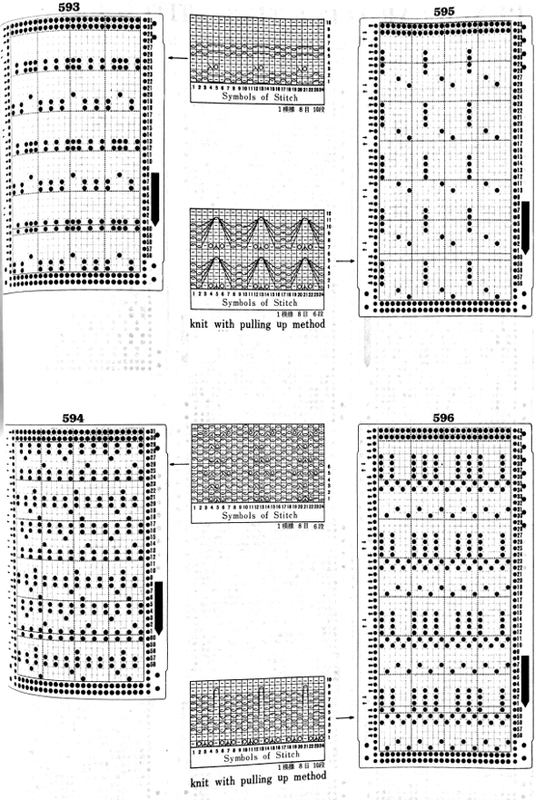 Punchcard machines mirror motifs when knit. 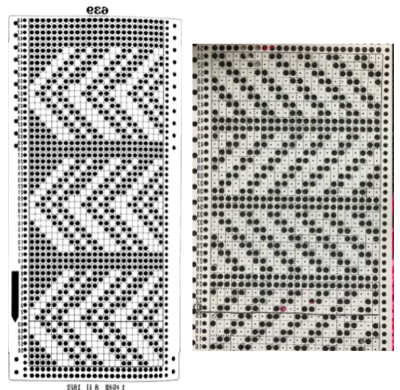 This may not be noticed when copying small repeats, but it becomes more evident in larger ones. 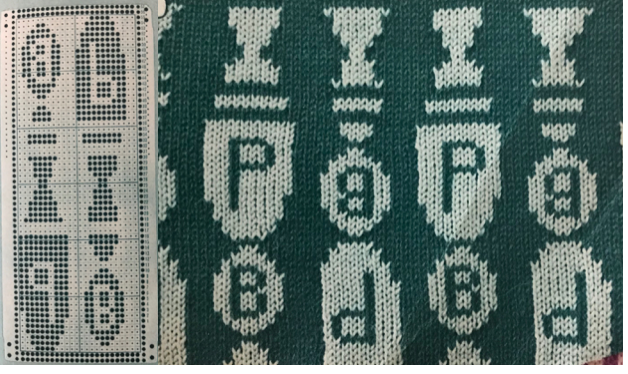 For knitting on the 910, the supplied motif would need to be mirrored when programmed to retain the intended direction. 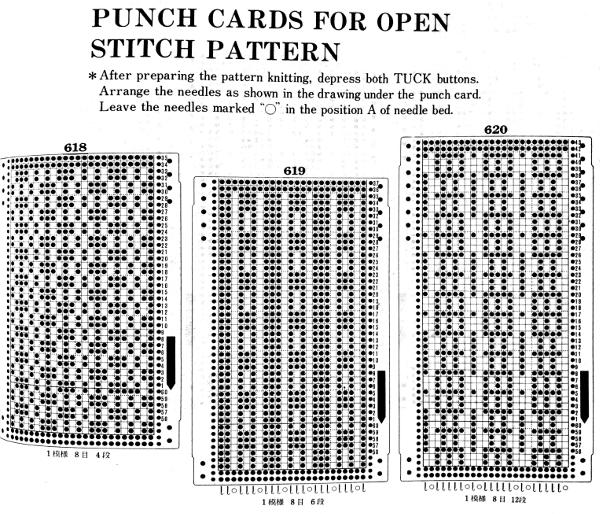 the 910 has settings KC I and II, KC II cancels end needle selection, while in punchcard machines this has to be done manually if the pattern stitch requires it. 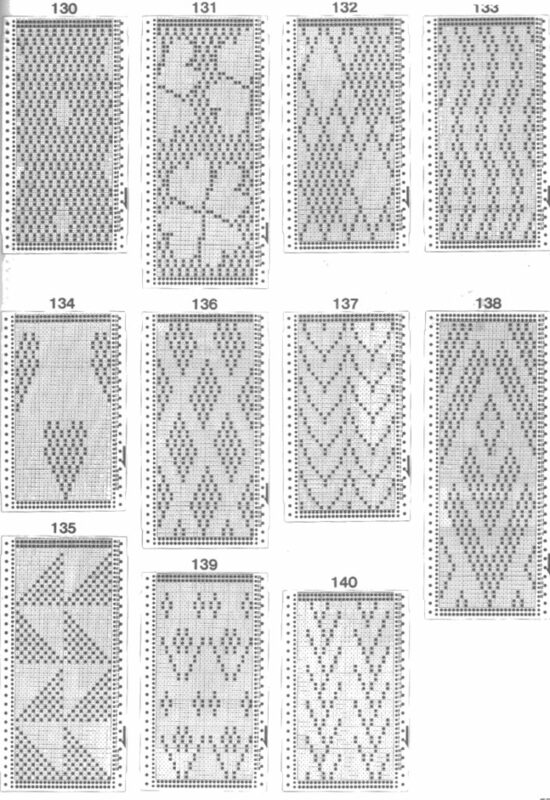 One such example is when any patterns are made with needles out of work. 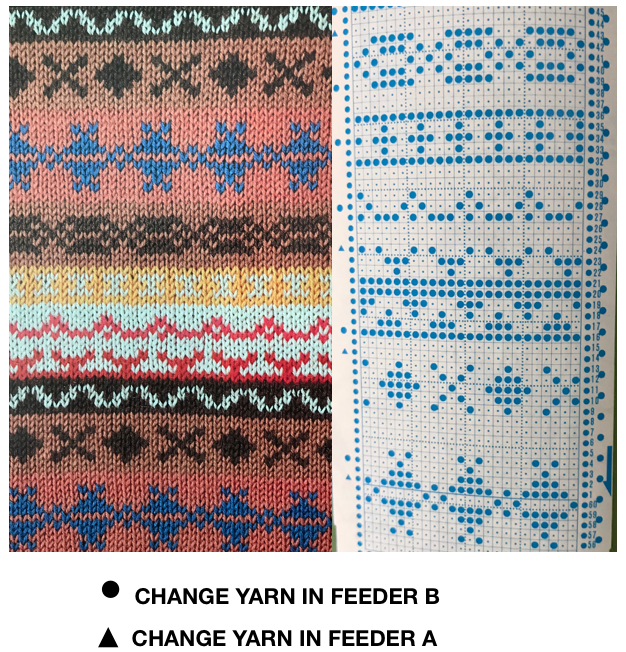 End needle selection would make the needles on each side of the empty space select forward and create a knit stitch. 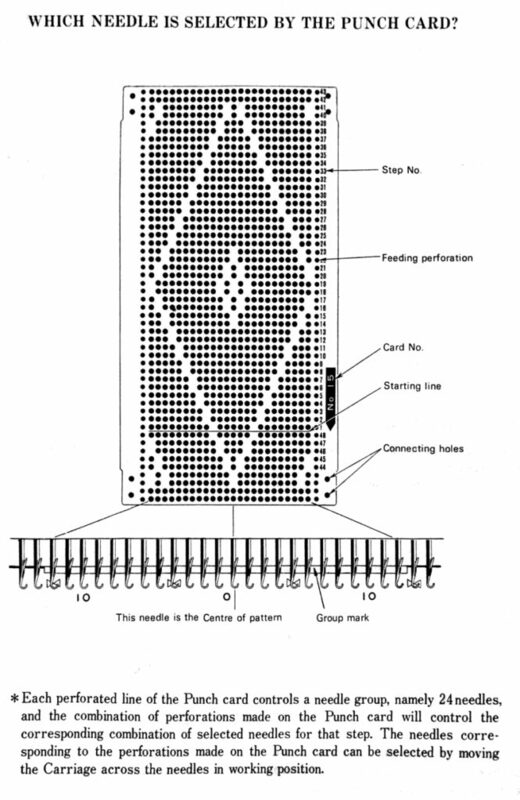 In tuck or slip, that would be an out of pattern knit stitch, in FI, a vertical line of the color in the B feeder would appear along on each side of the OOW needles.